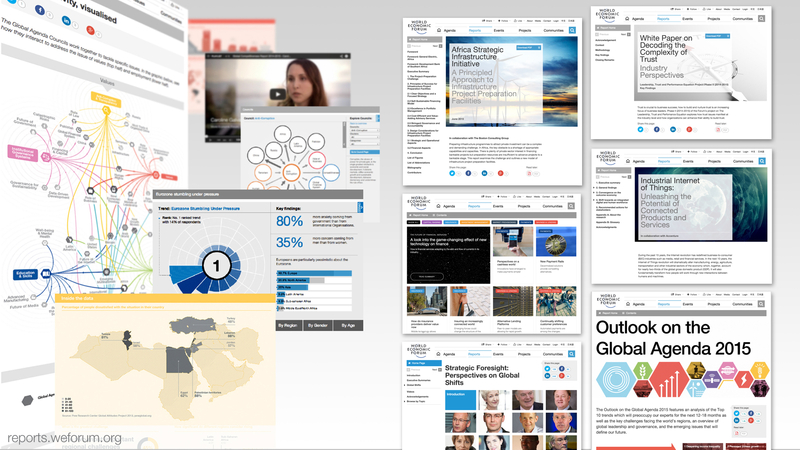 Five years ago The World Economic Forum launched its digital-first Reports platform. This was my first commissioned project for the Forum – a request from the Senior Director in charge of Communications – and it led to me becoming their Director of Information Interaction. It seems timely to revisit it, and evaluate its successes to see what we can learn from and improve upon. Since the launch, digital publishing has also evolved. My roadmap for the future product now contains a new content strategy in which we treat content like measurement data. By doing this, we’ll focus on content ‘usability’, re-usability, and user segmentation. Below are some highlights, observations, and the next steps for this new approach. The World Economic Forum produces over 70 reports, benchmarking indexes, white papers, and project micro-sites each year. Together, they aim to provide a year-round flow of analysis, opinion and data. They help decision makers make more informed decisions, reveal future opportunities, and provide new ways of thinking. They’re produced in partnership with our members, and reflect their strategic and collaborative priorities. They also assist the World Economic Forum to define Global, Regional and Industry Agendas. From modest readership numbers upon launch in 2011, the platform has grown to over 7.5 million page views per annum. The growth trend looks to double in the next year. The target audience is senior leadership and consultants within our member and partner organisations. It also includes governments, NGOs, business, and the general public who want to become informed and active. Our statistics show that over 170 countries visit this platform. Many of the most significant global companies and organisations also use it and reference its content. From the outset we aimed for digital format evolution. As with Marshall McLuhan’s observation “The Medium is the Message” the delivery format shapes the way we consume it. Many teams only know how to create a ‘Report’ with a Preface and Chapters and images. They replicate what they know from the world of print and paper. They seem unable to hold in their heads any model of multi-audience content and its usability, yet alone the vision to re-invent it. The result is that both the structure of this web platform and the structure of its content are susceptible to sub-optimal formats. Reports and micro-sites need consultants to read hundreds of pages, synthesise and condense the information, then redeliver the core insights and decision points to a leadership audience. This is time-consuming and cumbersome, and can reduce the freshness and value of the information. We converted articles into data visualisation pages in the Global Agenda Survey 2012. Readers can navigate pages using this visualisation. It also brought some data journalism to the global trend analysis. We built a database of Indicators, API, and data visualisation to power the Global Competitiveness Index 2014-15. This replaced hundreds of pages of PDF/paper and gave readers a tool to interact with instead. An interactive data visualisation was the main feature of the Global Risks Report from 2011-2015. It enabled exploration of its findings, impact and likelihood indicators. Such a tool significantly reduced the need for words, and allowed self-discovery of information. We introduced non-linear journeys to our Outlook on the Global Agenda. This added classification as metadata to all the content. It created groups of content for users to discover what’s most relevant to them. It personalised how they navigate and read the ‘Report’. This approach has become to central to other reports, including the Digital Transformation of Industries Initiative. We removed manual design layout for PDFs and Print for the Inclusive Growth Index’s scorecard pages. We created a server-side direct-to-print technology. On each scorecard page you can see a PDF link which was generated straight from the CMS. This technology will soon replace all manual page-layout work. Mobile, social, and sharing tools have been added to the platform. For the Outlook on the Global Agenda we added pre-filled tweets to help push key messaging onto social platforms. In this way we have covered a huge number of subjects including industry perspectives on infrastructure, trust, new technologies in finance, employment, the Eurozone, Energy Architecture Performance, Education, skills and Human Capital, and Strategic Foresight. Evolving this content platform has been an exercise in finding and working with high-level external talent. It has been achieved with a modest budget of tens of thousands of Swiss Francs per annum. For that budget, I consider the results to be remarkable. The main CMS is WordPress. 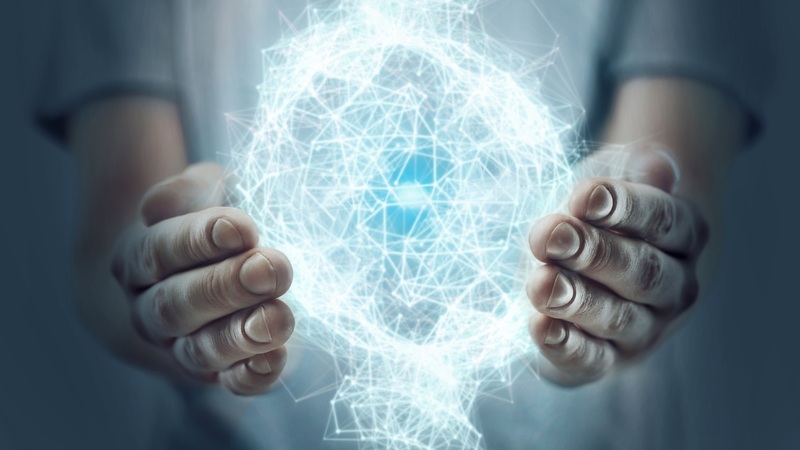 In order to get the power, control and content granularity we required, our lead develop created a metaCMS – called MasterPress – from the ground up. It supercharges our WordPress install. The structure it gives to our CMS admin and Post screens is mind-bendingly awesome. For our data visualisation and Global Indexes and their Indicator catalogue, we have a dataAPI built upon node.js from data supplied by CloudAnt, with bespoke objects rendered using D3.js, using React for UI and PrinceXML for server-side CSS3-to-PDF. What next? Content is becoming data and data is becoming content. I’m shifting our Content Strategy and User Experience work to become Object Oriented driven by an Ontology. This is efficient for developer techniques and frameworks. It will also create a powerful re-usable content ecosystem. The current content model for Reports (based on ideas from Print) allows them fade into obsolescence. That observation has a lot to do with the format and delivery platform. There is an emerging trend where content is becoming data and data is becoming content. As text is increasingly tagged, and as Machine Learning extracts concepts, entities and relationships from content, the metadata becomes as important as the text itself. The metadata is for the machines to reason upon and the text is for the humans to think about. This paves the way for statistical and predictive analysis through Machine Learning, and Conversational Interfaces. Circa created a news app based upon modular re-usable and re-combinable content – an archive of background material objects and new headline objects, as outlined by Fast Company and Lifehacker. Unfortunately, they closed their doors despite the excellence of their idea. Vox cards – A story is not seen as an isolated occurrence. The card stack idea represents the way that a story evolves over time, but gets aggregated in one place as a set. Washington Post Knowledge Map – Content is not just text with a date. It represents knowledge and facts which can be interconnected and converted into digital product infrastructure. BBC Semantic Publishing – For several years the BBC have been building semantic publishing. It is content with data structure. Algorithms and ontologies pull it to where it is needed. Our World in Data – Telling the stories around the topics that matter most to human civilisation, always with associated subjects and data sets. Google Trends uses the frequencies of searched-for terms as metadata. These effectively become live indicators, and can be used to track change over time, and extrapolate correlations or causes. Google’s Flu Trends was a strong example, but one where correlation became inflated. This fits perfectly with the Object-oriented Content Strategy I’m evolving. In this model, all content is an Object, with Core data and Metadata, and Relationships. It means that we’re rebuilding our Content Management System to become even more granular and Object Oriented. Content becomes re-combinable and re-usable in many contexts, for different target audiences. You can see more on the Reports platform and underlying knowledge modelling in my Graph Connect conference talk.